Today was the fifth straight day of burgers. Even though Fat Bruce Lee had pronounced this to be burger week, he gave up. He made some lame excuse involving chest pains and numbness in his left arm...whatever. I persuaded Jr. BurgerBuster, Bad JuJu, to join me on today's review. We settled on San Francisco Saloon Co. in West LA. We chose it for no better reason than it was close, and we had seen some positive Yelp reviews. Parking was plentiful along the street, and we found immediate seating in the bar area (full bar). The menu was simple and dominated by burgers. We ordered two of the SF Burgers with American cheese and fries at $9.50 apiece. The cheeseburgers arrived at our table within 8 minutes of ordering. 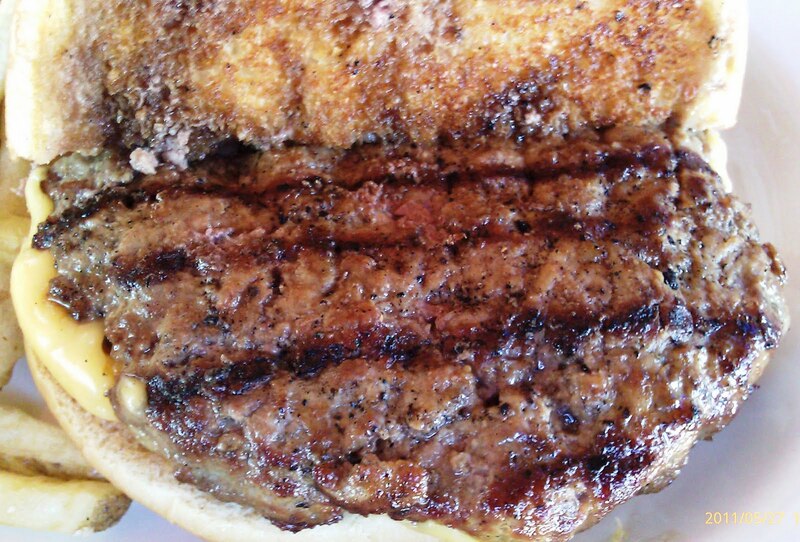 The Beef: Certified 100% Angus Chuck was what they were serving up at San Francisco Saloon Co. The freshly ground, 80:20 beef was juicy and a little on the oily side. The burger presented a pleasant note of carbon from the mild char off of the grill--the char was not present in the taste. It was flavorful with beef to begin the bite and iron at the finish. The iron taste in the beef was relatively strong, but the other ingredients served to mute this harsh note. The bite was toothsome without being rubbery. There were a few bits of connective tissue in the beef, but that was the price paid for in-house ground beef. The Seasoning: There was no seasoning in the beef, but the kitchen did apply a dash of salt to the exterior of each patty as it was grilling. The seasoning was perfectly adequate, and it served to give the mild beef a boost in intensity. 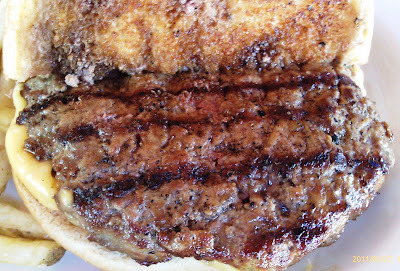 The Sear: The 6-ounce burger patties were relatively thin, and they were cooked on a gas grill, so it would have been nearly impossible to get a proper sear without a very hot griddle. The grill marks provided a little sear and some carbon, but certainly not enough to deliver any interesting shifts in flavor or texture. The Preparation: San Francisco Saloon Co. was actually grinding the Chuck while we were on the premises. It was that fresh! The 6-ounce patties appeared to have been cut with a mold to create their near perfect roundness and flatness. We had requested that the cheeseburgers be cooked to Medium, but they came out Med-Well. Still, the burgers were juicy. The burger patties were only turned once while on the grill--this was the appropriate way to cook burgers. The Cheese: The American cheese closely resembled thick slices of Velveeta, and this actually worked on these burgers. The melted "cheese" was sticky and gooey, and it served to moisten an otherwise dryish bun. Also, the umami notes in the cheese served to round out the beef and iron notes from the patty. The Bun: The bun was a dryish, well-toasted, seeded, standard, hamburger bun. The bun, by itself, would have been unsatisfying, but the juicy beef and extra gooey cheese filled in where the bun was lacking. The Fries: The fries were a let-down. The fries were cut in-house, and they were short and skinny. There was a dearth of salt, so the fries were bland. Additionally, they were undercooked, so they ended up being pale and a little doughy. The fries were a pass. The Value: It was $9.50 for a decent cheeseburger and a plate of fries. The value was fine but not great at San Francisco Saloon Co. The whole of the cheeseburger at San Francisco Saloon Co. was truly greater than the sum of its meat, bun, and cheese. Each of the component parts was lacking in certain aspects, but, when combined, the parts combined into a satisfying burger. Burger Review : This was a slightly better than average burger for an average price.